New Zealand and Australian went head to head in both the Boys’ and Girls’ Singles finals, and both finished 11-9 in the seventh. Who got over the line? 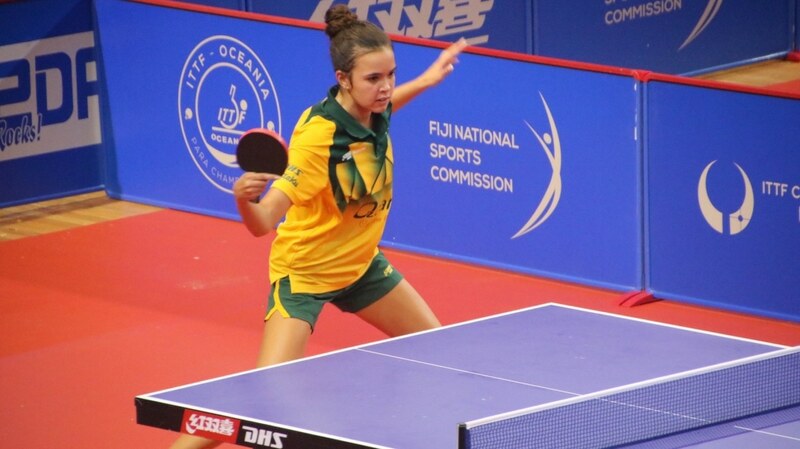 New Zealand and Australia shared honours at the ITTF-Oceania Junior Championships on the final day of play in Suva. Dean Shu (NZL) and Holly Nicolas (AUS) game up with the goods to claim gold in Vodafone Arena. But only just. In both encounters the final score was 11-9 in the seventh game. Dean Shu got off to a slow start against Australia’s Rohan Dhooria, losing the first. However he quickly changed the tide and took a 0-6 lead in the second game. At 7-7 with score level at two games a piece, a miss from Dhooria led to some serious foot stamping; the tension was obviously getting to him. In the deciding game the pair were point for point until 9-9 in seventh. At 10-9 Shu only needed one match point to take the title. Despite the close encounter the Kiwi was brimming with confidence before the match. Meanwhile it was back to the drawing board and maybe the gym for Dhooria. “My fitness was lacking over a seven game match, I’ve got to work on this.” Rohan Dhooria. In the girls’ event Holly Nicolas was the quite simply the golden girl. Despite surrendering a 3-1 lead, Nicolas was able to keep her cool against Nai Xin Jiang (NZL) to also win 11-9 in the seventh. Jiang was a surprise finalist after finishing second in her group during the qualification rounds. “I thought she would come back. She really started to understand my tactics. But I had to dig deep under the pressure to get the win.” Holly Nicolas. With the win Holly Nicolas claimed every junior gold medal on offer, adding to her teams and doubles collection.